This is another excellent video from the vlogger and stand-up comedian, Richard Coughlan. In this one he utterly destroys the video that has been going around, and been promoted by the far right, that within a few years Muslim immigrants will outbreed the traditional western European inhabitants of Europe. This is part of the general ‘Eurabia’ scare, again heavily promoted by the racist and Islamophobic right, that due to the massive disparities between White European and Muslim birthrates, Muslims will soon become the dominant ethnic group in Europe, with Whites a minority in their own countries. Coughlan goes through the statistical claims made in the video, and refutes them with the real statistics. At one point he shows that instead of Muslims immigrants to France having eight children for every one White French child, the real figure is much lower. Most Muslim immigrants to France come from Algeria, where the birthrate is actually 2.1, which isn’t far off the European average birthrate of 1.6 or whatever. He also demolishes the claim that Muslims will soon outbreed ethnic Germans. The video does this by cherrypicking bits from an official demographic report compiled by Herr Rademacher of the German statistics department. Rademacher’s now joined the EU statistics department, and has made a statement about the abuse of his statistics in the video. He states that the real figures are much less, and that there is absolutely no chance of Muslims overtaking Germans. He is also understandably quite angry about his figures being so abused. He also makes the point that rather than having just arrived in Britain fifty years, Muslims have been around for a very long time. He states that the first record of a Muslim in Britain dates from the 8th century. Coughlan’s an atheist, and concludes the video by pointing to the video’s own ending, where it urges its viewers to share the Gospel. It is, according to him, a piece of fundamentalist Christian propaganda. He does this to attack those right-wing atheist vloggers and pundits on YouTube, that have promoted it, and criticizes them for using such a Christian piece of religious propaganda to support their anti-Muslim bigotry. As an atheist, he considers one equally as bad as the other. I am very definitely not an atheist, and have absolutely no problems with any Christian wishing to share the Good News. However, this video is not about spreading the Gospel. It’s about creating a sense of impending panic and racial fear, a fear that can only lead to more extreme nationalism amongst White Europeans, religious and ethnic friction and violence. I have therefore put this video up, because these pernicious demographic lies have been circulating for several years now, and are at the heart of much EDL and BNP propaganda. Both of these groups have claimed that due to the rise in the European Muslim populations, there will be a race war in the next decade as the Muslims seek to impose their dominance on the country by force. At the last election one of the Kipper politicos in Wiltshire had to resign because he repeated this vile lie. This evening, Jon Stone for the Independent published this story on the newspaper’s website Britain must look at replacing the NHS with an insurance system, Nigel Farage says. The National Health Service may have to be replaced with an insurance system within the next decade, Nigel Farage has said. The Ukip leader said anyone who believed the current way of paying for medical care in the UK had to be preserved “frankly isn’t thinking” and that he was open to “rethink[ing] the whole thing”. Mr Farage also likened Ukip’s rise to that of Margaret Thatcher. “There are times in a country’s politics where radical change is needed,” he told BBC’s Newsnight programme on Thursday evening. Farage then claimed that, despite increased spending on the NHS, there were fewer beds, and that strains on the NHS would increase as the British population expanded to 80 or even 100m. Stone’s article mentions that in their 2010 manifesto the party stated they would introduce health vouchers for people, who wished to opt out of the NHS. However, far from being inefficient, Stone points out that in a survey of 11 countries’ health care, Britain came first for efficiency. The worst was America, precisely the people Fuhrer Farage wishes to copy. The article can be read at: http://www.msn.com/en-gb/news/uknews/britain-must-look-at-replacing-the-nhs-with-an-insurance-system-nigel-farage-says/ar-AA9mewY?ocid=OIE9HP. Go and read what Farage’s views on the health service really are. This isn’t really much of a surprise. Farage’s views on the NHS have been common knowledge for a long time, along with those of his deputy, Paul ‘Eddie Hitler’ Nuttall. The Kippers have, however, been trying to keep them quiet in case they put voters off. The last time Farage mays noises in this direction, he was effectively told to shut up by his stormtroopers. He then promised that at some time they would have to have ‘this conversation’ about replacing the NHS. He’s now broken his silence. Farage has previously tried to sweep all this under the carpet by disowning it. He stated that their 2010 manifesto was ‘absolute drivel’, and whenever anyone pointed to the extremely rightwing, corporatist utterances of himself and his fellow stormtroopers, he’d try and block any further discussion with the statement, ‘That’s not official UKIP policy’. It’s now gone far beyond that. Fuhrer Farage has nailed his colours to the mast, and shown everyone that, unless you’re extremely rich you can afford the best healthcare money can buy, there is absolutely no point voting UKIP. And especially not if your working or lower middle class. I’ve reblogged articles detailing the legislation giving workers’ rights at work, going back to 1850, that Farage and his fellow corporatist warriors wish to repeal. Only yesterday I published one from Cablestreetbulldog showing how the Kippers hate and wished to destroy sick pay, paid holidays, maternity leave and a whole range of other, hard-won rights for working people. The Bulldog put these up to attack Farage’s spurious claim to represent the workers. He doesn’t. Quite apart from the fact that his own xenophobia runs counter to many people’s ideal of Britishness. The Bulldog’s slogan on his site is ‘Because Bigotry ain’t British’. And let’s also have no doubts about Farage’s claims of the rising British population leading to strains on the NHS. This is rubbish. It’s another bit of scaremongering. The Kippers’ propaganda is all about immigration making extra strains on state resources. Now I don’t doubt that in some cases that’s correct. In other cases, it’s rubbish. There have been repeated studies showing that actually immigrants and migrant workers support the British economy, rather than drain it. Now the Right in both Britain and across the Atlantic are deeply concerned about falling birth rates in the West. Over on this side of the pond, you can see it in articles in the Daily Mail attacking feminism for taking women out of the home and making them pursue careers, rather than staying at home to raise families. One of the reason this is a major issue is that the economy needs an expanding population. They need more people to buy their products, quite apart from supplying the labour needed for what remaining jobs haven’t been mechanised out of existence. If there are fewer people, the economy contracts. If the economy contracts, it means that there are fewer taxes being paid to support the welfare state. If there are more people, then there is more tax being paid to support government services. Farage’s argument about the threat to the NHS from a larger population is a pure red herring. Not least because many of the immigrants in this country actually work in the NHS, and have done so ever since Enoch Powell deliberately recruited Indian doctors and Black and Asian medical professionals to fill the employment gaps in the NHS. Put simply, Farage is trying to use fears of rising immigrant population to push what he wants anyway – a private healthcare system, run for profit. As a financier, Farage stands to make a buck out of this, along with his Tory counterparts with their noses in the trough of NHS privatisation. Like one Iain Duncan Smith, the underpants bandit. According to the Independent article, Farage will be publishing their official policies in their 2015 manifesto in the coming months leading up to the election. According to stats I looked at yesterday, their electoral surge may well have passed its peak. Nationally, only 10 per cent of the population has said their willing to vote for them. And only 2 per cent of young people will. Let’s hold their feet to the fire on this one, and make sure Farage, Nuttall and the rest of his party of embittered reactionaries and barely closet Nazis can’t wriggle out of it this time. 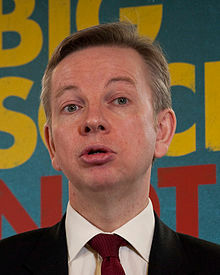 Michael Gove: Believes Global Warming is another piece of ideology dreamed up by academics. This time their ‘activists’ not ‘Left-wing’, but same anti-intellectual drivel. Looking through the politics section of Waterstone’s the other day, I found James Delingpole’s Ecofascism. I didn’t buy it, because its author’s name pretty much told me what I could expect. Delingpole is a columnist for the Telegraph and Spectator, who specialises in pieces describing at length how disgusting and depraved the underclass are. I am not remotely surprised Delingpole has also decided to produce a lengthy diatribe against the Green Movement. Conservatives on both sides of the Atlantic have a bitter hatred of the Green movement. they dislike the way it seeks to limit the activities of industry in order to stop humanity fouling the planet even further. They also resent the Green tariffs levied on polluting industries, like the notorious ‘carbon tax’ to limit carbon dioxide emissions, as a form of Socialist redistributive taxation by stealth. Hence the attacks on anthropogenic global warming by the former Tory chancellor, Nigel Lawson, and Michael Gove’s attack on it being taught in the class room. The Conservatives have also tried to block Green initiatives through the foundation of fake grass-roots, ‘astroturf’ pressure groups, like Wise Use in America. As with the Right’s attempt to link Socialism with Fascism, because of the latter’s inclusion of some Socialist or anti-capitalist policies, so Conservatives also link the Green movement with Fascism because Hitler also favoured certain Green policies. In his Table Talk, for example, Hitler discusses the need to protect the German natural environment and develop renewable energy supplies. Of course, simply because Hitler shared these ideas does not automatically mean they are in any sense Fascistic. Much of the Green movement is left-wing in political orientation. A large part of the Anarchist movement is very Green. There was a Green Anarchist group and magazine in Britain in the 1990s. The German Green party had, amongst its leaders, the Baader-Meinhof Gang’s former lawyer. There is, however, a problem in that some parts of the Fascist extreme Right is also Green, or presents itself as environmentally concerned, because of Hitler’s own Green inclinations. Neo-Nazis have attempted to infiltrate the Green movement. A little while ago the Anarchist publishers, A.K. press, produced a small book describing the way various Nazi groups and organisations were attempting to do this. Murray Bookchin, one of the leading ideologues of modern, post-scarcity Anarchism, walked out of one conference after a former East German dissident declared that we needed a ‘Green Adolf’. Unfortunately, some parts of the Green movement also echo the genocidal rhetoric of Nazism in their desire to limit the growth of the human population. David Attenborough, who is very definitely not a Nazi, was criticised by a Tory local councillor a year or so ago after he made an appalling comment about the West sending aid and food to the Developing World. Attenborough had said that we must be mad to send food to Starving Africans, when the lack of resources meant that there was no food to support them and the local wildlife in their overpopulated area. He later apologised for his statement and said that he was more concerned with the survival of human children than with animals. Such sentiments, however, are not limited Nazis, Left-wing or ‘Deep’ Greens or ecologically-concerned scientists and television presenters. They can be also be found amongst figures, whose politics is probably best described as extremely reactionary Conservative, like the millionaire zoo-keeper, Jack Aspinall. Aspinall runs a number of private zoos around the planet. He has one in Australia, which appeared on one of the animal programmes on ITV several years ago. The programme showed the late Australian zoologist and TV presenter, entering the gorillas’ enclosure so he could enjoy some quality with these majestic apes. It was great television, with some fascinating and delightful shots of Irvine being accepted by and playing with these animals, just as David Attenborough himself did all those decades ago in Life On Earth. It’s definitely not safe for everyone, however. When the late Johnny Morris entered a cage with some aggressively boisterous young males, they ran at him several time, knocking him over and leaving him with several broken ribs. Aspinall himself is extremely Right-wing, and definitely seems to prefer animals to people. He was in the news several times in the 1990s after his animals killed two or three of their keepers, and a tiger badly mauled a model’s arm. Brian Masters, in his biography, The Passion of John Aspinall, quotes him as saying that the world, including Britain, was vastly overpopulated. Here in Blighty we needed to cut our population down from about 60 million to eight. He also declared that we need a Right-wing counter-revolution, ‘Francoist in spirit and determination’. Franco was indeed a Fascist dictator, but his regime also included other groups in order to counterbalance the Phalange’s radicalism. His regime has therefore been described as essentially palaeo-conservative, using the trappings of Fascism to give it a more modern guise. Aspinall’s own political beliefs appear to be the same – extreme Right-wing, illiberal anti-democratic Conservative, rather than Fascist. Nevertheless, he clearly identified with that part of Fascism. This doesn’t affect Green politics as a whole, however. There is still an ecological crisis of immense proportions facing the planet, and whatever Gove or Lawson say to the contrary, by far the vast majority of scientists are convinced of the reality of anthropogenic global warming. It is the Green movement’s Conservative detractors, who are ideologically driven, not the Greens themselves. And regardless of ‘Green’ varieties of Nazism and Fascism that appeared during the 1990s, at least one of those, who could be described as Eco-Fascist, Jack Aspinally, was an arch-Conservative. But somehow I doubt that’s something Delingpole or Gove would really like to admit in their campaigns against the ecologically conscious and Left-wing academics and intellectuals. Late yesterday evening there was a story on the MSN News about Phil Taylor, a Conservative councillor in Ealing, who had been told to resign for his comments on Twitter about David Attenborough. According to the article, Taylor had been angered by a statement by Attenborough on the need to curb the growth of the world’s population. He tweeted ‘I do wish this silly old fart would practice what he preached and take a one-way trip to Switzerland’. The leader of the Labour Party in Ealing Council, Julian Bell, condemned Taylor’s comments, and demanded that he should either apologise or resign. Taylor was also criticised by Scott Freeman, from the anti-bullying charity, Cybersmile, for setting a bad example and encouraging cyberbullying. In reply to these criticisms, Taylor said in an email “My tweet reflected my frustration with Attenborough repeatedly using his ‘national treasure’ status to promote a set of views that see people as being a problem. His prescriptions seem always to apply to other people. The article concludes with the simple statement that ‘Sir David said in a radio interview this morning that he recognised that population controls were a controversial area and emphasised that he felt more strongly towards a human baby than any animal. Now the Right does not like Green politics. In America Green politics are criticised as a Left-wing strategy for increasing taxation, regulation and enforcing income redistribution. The last means Republicans don’t like it because the Greens want to take money from the rich and give to the poor. Conservatives in America and Britain believe that Big Business has an absolute right to exploit, pollute and destroy the environment and its flora and fauna. In response to pressure from Green politicians and environmental groups, they have set up astroturf organisations, like ‘Wise Use’ to counter such criticism and present Conservatives as advocating instead a responsible approach to the environment in line with a policy promoting the proper exploitation of the natural world. “What are all these famines in Ethiopia, what are they about? They’re about too many people for too little land. That’s what it’s about. And we are blinding ourselves. We say, get the United Nations to send them bags of flour. That’s barmy.” According to the article, he stated that overpopulation was a problem, and that if we didn’t tackle it, nature itself would, as it had done for a long time in the past. He also believed that the major obstacles to managing the world’s population was the attitude that having children was a human right, and the Roman Catholic Church’s prohibition on contraception. He also acknowledge that his statement about Ethiopia and its starving could be ‘misconstrued as an attack on poor people as the issues of major concern were in Africa and Asia. The article about his comments can be read here:http://news.uk.msn.com/articles?cp-documentid=257478670. 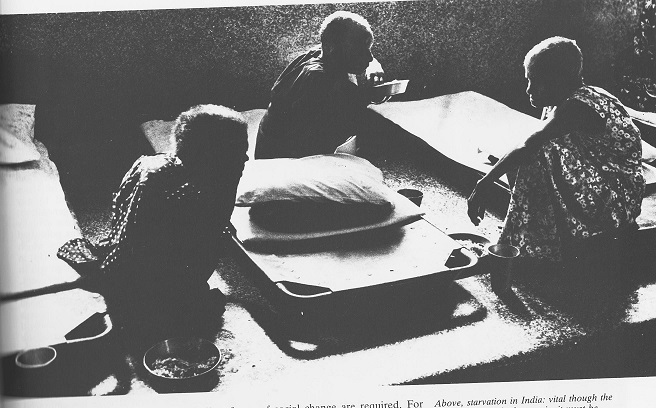 The victims of a famine in India. David Attenborough doesn’t want the UN to give food to people like these. Now Attenborough has shown himself with these comments to be monstrously ignorant and callously indifferent to global suffering. I have been extremely unimpressed with Attenborough for several years now, ever since he added his voice to that of Richard Dawkins in sneering at religion. That’s a different issue, but I found his remarks then ignorant and uninformed, as countless people of faith, and particularly Western Christians, did contribute to the rise of science. For a more complete discussion of how Christianity laid the basis for modern science, see R. Hooykaas, Religion and the Rise of Modern Science (Edinburgh: Scottish Academic Press 1971). I was also not impressed by his attitude, which suggested that Darwin’s Theory of Evolution by Natural Selection had somehow disproven the existence of God. I’ve blogged several times on this issue. For a proper discussion of this issue, see Own Chadwick, ‘Evolution and the Churches’ in G.A. Russell, ed., Science and Religious Belief: A Selection of Recent Historical Studies (London: The Open University/ University of London Press 1973)282-93. These are separate issues. Attenborough’s comments here also seem woefully ignorant and misinformed. Let’s take his comment about the Roman Catholic church’s stance on contraception being part of the problem. In actual fact, many cultures and religion advocate large families. In tradition Moroccan society, a family with fewer than 12 children was described as ‘unfinished’. The pagan religions in Africa also lay great stress of large families and the fertility of their flocks and herds. As for attitudes to the environment and animal life, Nigel Barley in his account of his fieldwork amongst the Dowayo people of Cameroun, The Innocent Anthropologist, noted that they had very little knowledge of the animal life around them, and were quite prepared to exterminate any creature they disliked, such as lions. He states that family planning is so unpopular that there is a joke that the only thing that will not be opened and misappropriated when you send it through the post in West Africa is a packed of condoms. He also does not seem to know, or understand the reasons why the developing world, and indeed Britain and the West before the twentieth century, had large families. These were massive infant mortality rates and to provide support for the parents in their old age. Barley himself says that one of the most moving demonstrations of the tragically high rate of death in childhood in Africa is a question in the Nigerian census form. This asks you how many children you have. After this is the question ‘How many are still living?’ In traditional societies, such as Britain before the establishment of the welfare state in 1948, there is no or little state provision for citizens in their old age. People therefore have large families in order to support them when they have become too elderly to manage for themselves. 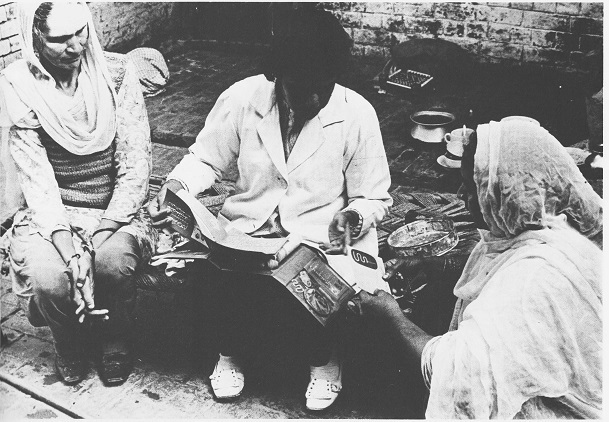 Women in Pakistan receiving contraceptive advice. Attenborough also seems to have ignored the fact that globally, birth rates are dropping. Governments throughout the developing world have launched campaigns to control their populations through family planning and contraception. This includes the developing world. The French anthropologist, Richard Tod, has pointed to the fact that, although families in the developing world may be much larger than in the West, there has been a dramatic decline. In some Middle Eastern nations, such as those of the former Soviet central Asian republics like Azerbaijan, for example, the birth rates are comparable to those of Western Europe. In Britain and much of the developed world, including Germany, Italy, Russia and Japan, the birth rate is actually below replacement levels. The population in Britain has grown only because of immigration. The Japanese are so concerned about their demographic decline that Japanese newspapers have run stories predicting that in a thousand years’ time, the Japanese people will be extinct. One of the reasons why the Land of the Rising Sun is putting so much resources into developing robots is to create a suitable workforce. The Japanese are unwilling to permit mass immigration to provide the country with labour, and so have turned to cybernetics and robots instead. In fact the global decline in the birth rate has alarmed some demographers, anthropologists and economic planner. In mid-1990s New Scientist carried an interview with a scientist, who believed that population growth had peaked or was peaking. He believed that by the middle of this century there would be a population crash. The result would be increased strain on the welfare state due to the cost of caring for an aging population. The economy would also contract, and countries would have to compete with each other to attract migrants to join their nations’ workforce. He also believed that the high mortality rates in some African nations coupled with a low birth rate would cause their populations to shrink. He believed that the first nation that could be so affected would be Ethiopia. We are here looking very much at the kind of dystopian future predicted by the film Children of Men. This portrayed a Fascistic future Britain, in which no children had been born for 18 years. Attenborough’s comments here also threaten to increase racial tension and spur on the rise of the racist Right. IN Britain and America the Fascist and Nationalist Right see demands by the ruling elite that we should limit the size of our families as part of a policy of racial extermination directed at the indigenous White population. They believe that there is a deliberate policy by the liberal elite of wiping out Whites, and replacing them with Black and Asian immigrants. Attenborough’s comments will be seen by them as another example of this policy. Black Nationalists may also see it as a racially motivated attempt to exterminate them. Private Eye a few years ago reported the outrageous comments by a Black leader in South Africa, telling people not to use contraception to stop AIDS as this was really another racist attempts by Whites to limit the Black population. Such statements have some verisimilitude due to the fact that BOSS, the South African secret service, had at one time been active trying to develop diseases that would specifically target Blacks. Attenborough might fear that his comments may be ‘misconstrued’ as an attack on the poor of Africa and Asia, but given the highly mixed legacy of European colonial administrations, one cannot reasonable blame them for doing so. About ten or so years ago a history book came out. It was entitled ‘Third World Holocausts’, or something like that. I can’t remember the exact title. I do, however, remember what it was about. The book described the way European colonialists had committed terrible atrocities in their African and Asian possessions from the political and economic ideologies of the time. In the 19th century, for example, there was a terrible famine in one of the Indian states. I believe it was Bengal, during which millions starved to death. The Raj refused to import and distribute food to its victims from the belief that this would undermine the principle of free trade they were trying to adopt across the Empire. Irish victims of the Potato Famine queuing to emigrate. Much closer to home, Attenborough’s comments recall the attitude of British politicians and civil servants during the Irish Potato Famine. The head of the British civil service, Trevelyan, stated that the victims of the famine should be left to starve. It was, he stated, their fault due to their improvident and irresponsible lifestyle. 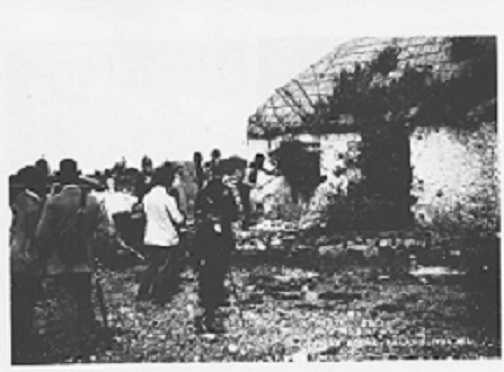 The result was the legacy of bitterness and hatred which further fuelled Nationalist demands for home rule under Charles Stuart Parnell and violent revolution from the Fenian Brotherhood and later Irish Republican groups. Attitudes like Attenborough’s have partly contributed, however, remotely, to the rise and persistence of terror groups like the IRA. Attenborough’s views are also similar to some other, viciously misanthropic, extreme Right-wing views found in certain sections of the Green movement. In the 1990s one of the anarchist groups became alarmed at the Fascist tendencies then entering the Green movement. Murray Bookchin, a leading anarchist intellectual, who advocates Green, post-scarcity Anarchism, walked out of a Green conference in Germany when one of the speakers, a former East German dissident, declared that they needed a ‘Green Adolf’. Private Eye, in ‘Ape Sh*t’, its May 1988 review of Brian Masters biography of John Aspinall, The Passion of John Aspinall, remarked on the thuggishness of Aspinall’s political opinions. Aspinall has stated that humans are ‘vermin’, and stated that he favours a policy of ‘beneficial genocide’. He believes Britain’s population should be reduced from 54 to 18 million. He also has explicitly Fascist political sympathies. He supports ‘a right-wing counter-revolution, Franco-esque in spirit and determination’. See Francis Wheen, ed., Lord Gnome’s Literary Companion (London: Verso 1994) 226-7 (p,. 226). Now I don’t think Attenborough is a Nazi. He has not advocated a Fascist dictatorship nor has any racist views. Indeed, quite the opposite. His programme, Man Alive, in the 1970s brought anthropology to British television and he was always polite and courteous to the primal peoples he spoke to and whose lives he explored. It’s a pity that this respect has not been extended to their children or grandchildren forty years later. Attenborough himself has been responsible for some of the very best of British television. He has delighted and educated the British public with his programmes on animals and wildlife for about sixty years. The BBC’s Natural History Unit in Bristol has brought from fame and honour to the city for its achievements in wildlife broadcasting. When he was controller of BBC 2, he was responsible for bringing some of the most innovative ideas to British television. Who now remembers Brass Tacks, a programme which allowed members of the public to talk about their political views? Unfortunately, Attenborough’s views in this instance less resemble those of an enlightened, genuinely liberal educator, but that of a loudmouthed bigot. I’ve been told that the Macc Lad’s songs were not meant seriously. Sadly, Attenborough here appears to have joined them, and this time meant it. I would hope that Attenborough reconsiders his position in this matter, and issue the apology for his comments that they demand. Apart from this, problems of a vastly overpopulated world has been portrayed in two films, Soylent Green, starring Charlton Heston, and ZPG (Zero Population Growth), starring Oliver Reed. The future in ZPG is one in which, due to population pressure, even domestic animals, such as dogs and cats, have become extinct. The plot involves the attempts by the hero and his wife to preserve their child after the government outlaws having children. Here’s the trailer for Soylent Green. And this is the movie trailer for ZPG.